Spread over an area of 304 hectares, Mexico City’s Central Wholesale Produce Market deals in just about everything from fruit and vegetables, flowers, birds and meat, fish and seafood to dairy products, groceries, sweets, seeds, cereals, tinned products, raw materials and cleaning products – and countless more! In all, it generates more than eight billion dollars annually and supplies the daily needs of 20 million people. It is the country’s largest business centre, second only to the Mexican Stock Market. 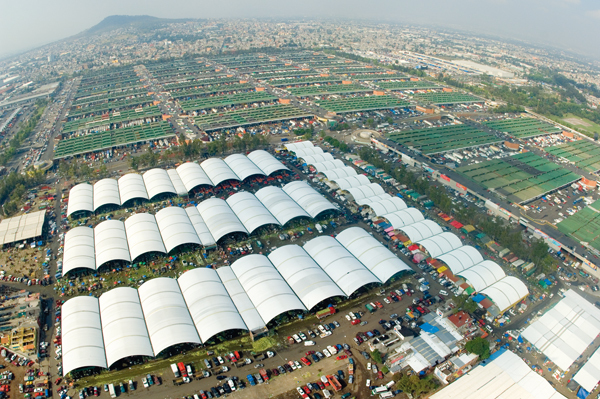 Located in Iztapalapa’s political subdivision in the East of Mexico City, the Central Wholesale Produce Market (CWPM) was opened in November 1982 in order to ease the overflowing commercial strain of ‘Merced Market’ - Mexico City’s main market located in the city centre. Its rapid growth was making it a ‘mega market’, which by the 1970s was causing impossible urban and environmental problems. Local government responded, and by March,1981, construction of the new market began. The main purpose of this enormous wholesale market is to satisfy the food requirements of the city’s inhabitants. Its functions, however, are not only the storing and commercialisation of goods, but also the regulation of strategic supply and demand in relation to the country’s economic activity. Some of the wholesale market’s traders are both producers and wholesalers, while others are wholesale distributors. This ensures that the prices of products are always the cheapest available in the market. The CWPM hosts a vast range of services – for example: media comprising “Notiabasto”, “CEDA Informa”, among others; social awareness, sporting and cultural affairs; “La Bodega del Arte” (The Art’s Storehouse) Cultural Centre; Centre of Support to the Young Worker; a government hostel; a football league; food banks; 17 branches of nine banks; governmental offices; a fish and seafood market (not part of the CWPM); restaurants; petrol stations and a telephone service supply branch. It is important to emphasise that the CWPM undertakes a variety of social activities through the above-mentioned services, providing support to the lowest social classes through the Hostel and Centre of Support to the Young Worker and the National Institute for Adult Education. The traders’ association has entered into agreements with institutions of private assistance such as “Solo Por Ayudar” (“Just to Help”) and “Alimento Para Todos” (“Food for All”) to which they grant donations for distribution among the needy. CWPM businessmen also increase their support in the event of natural disasters.